The Ejs Car on an Inclined Plane model displays a car on an incline plane. When the car reaches the bottom of the incline, it can be set to bounce (elastic collision) with the stop attached to the bottom of the incline. The car consists of the car body, two rotating front wheels, and two rotating rear wheels. The incline angle (in radians) can be changed via a textbox. In addition the car can be dragged to its initial position. You can modify this simulation if you have Ejs installed by right-clicking within the plot and selecting "Open Ejs Model" from the pop-up menu item. 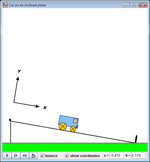 Ejs Car on an Inclined Plane model was created using the Easy Java Simulations (Ejs) modeling tool. It is distributed as a ready-to-run (compiled) Java archive. Double clicking the ejs_mech_newton_CarOnInclinedPlane.jar file will run the program if Java is installed. Ejs is a part of the Open Source Physics Project and is designed to make it easier to access, modify, and generate computer models. Additional Ejs models for classical mechanics are available. They can be found by searching ComPADRE for Open Source Physics, OSP, or Ejs. The source code zip archive contains an XML representation of the Car on an Inclined Plane Model. Unzip this archive in your Ejs workspace to compile and run this model using Ejs. W. Christian, F. Esquembre, and M. Belloni, Computer Program CAR ON AN INCLINED PLANE MODEL, Version 1.0 (2008), WWW Document, (https://www.compadre.org/Repository/document/ServeFile.cfm?ID=8242&DocID=879). W. Christian, F. Esquembre, and M. Belloni, Computer Program CAR ON AN INCLINED PLANE MODEL, Version 1.0 (2008), <https://www.compadre.org/Repository/document/ServeFile.cfm?ID=8242&DocID=879>. Christian, W, F. Esquembre, and M. Belloni. "Car on an Inclined Plane Model." Version 1.0. https://www.compadre.org/Repository/document/ServeFile.cfm?ID=8242&DocID=879 (accessed 19 April 2019). Christian, Wolfgang, Francisco Esquembre, and Mario Belloni. Car on an Inclined Plane Model. Vers. 1.0. Computer software. 2008. Java (JRE) 1.5. 19 Apr. 2019 <https://www.compadre.org/Repository/document/ServeFile.cfm?ID=8242&DocID=879>. Thanks to Wolfgang Christian, Francisco Esquembre, and Mario Belloni for sharing the source codes, that allow me to learn and create repurposed applets.